Update Notes / Updates January 25th 2019 - Activity / Kill Log Overhaul and Completionist Cape! Good luck on your Completionist cape grind! Update Notes / Updates December 5th - Winter Special, New Wings, Gulega and Fixes! 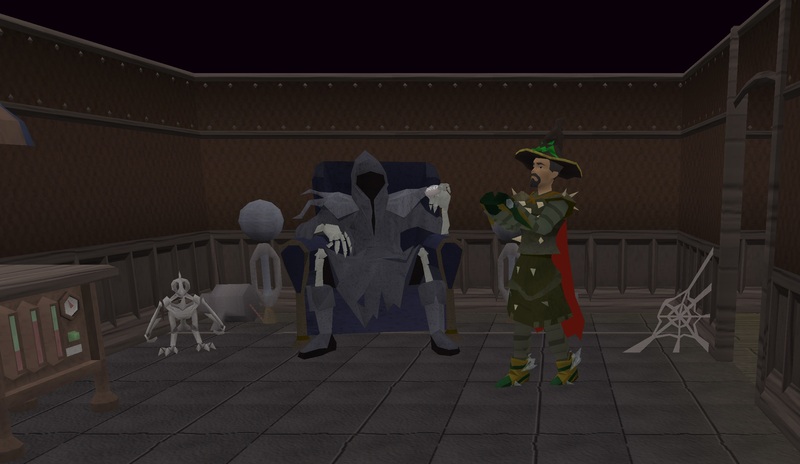 A new and dangerous foe has appeared inside the Mage arena (wilderness). Their best drop is the Zaryte bow (1 in 250) introducing a new tier 82 shortbow. It has infinite ammo and needs to be repaired after 20,000. Gulegas require level 89 Slayer to be killed. Its droptable will soon appear on the wiki. Due to the recent demand in vials I've given it a common 80-120 noted vials of water drop. That's not completely solving the problem of obtaining vials, but it will definitely ease the process on higher accounts. I've enabled the Christmas event(s) from the past years. I'm still looking into the creation of new items and rewards, but you're already able to complete or ruin parcel deliveries. The Christmas tree along with snow drifts have also been re-added into the game! I've also slightly edited the floor and created a snowing effect through the particle system. Special thanks to JP for creating a new miniquest, the Taxidermist and Big Fish Exchange through emps-script. You can start the miniquest called Helping out the Chef north-east of Barbarian village. The Taxidermist can be found in Canifis buying unused slayer head drops for good money. Harry in Catherby exchanges big fishes (bass, swordfish, shark) for 100 noted small equivalents. If you're also interested in adding content to the game through the scripting language, contact us on Discord! NPCs will no longer be aggressive while being inside the tutorial of Thomy showing you the game. You can no longer equip all items from the bank interface. Kal'Ger now correctly resets his attack phases when getting out of combat. A bug within the Construction code was fixed, which allowed you to stay registered inside a house although already having left it. Items that can no longer be equipped will now automatically be unequipped. Teleports now make you invincible when being casted instead of when being applied. That means that the moment you start teleporting it's impossible to die during that animation. Several items have had their options fixed: coal bag, enchanted gem, yo-yo and pouches. The attack interface of crossbows has been reworked. It now shows an image of a crossbow instead of a bow. Cyclopses now share the drop table of Hill giants. Defender drop rates remain untouched. Resetting skilling actions now also properly resets your current animation. 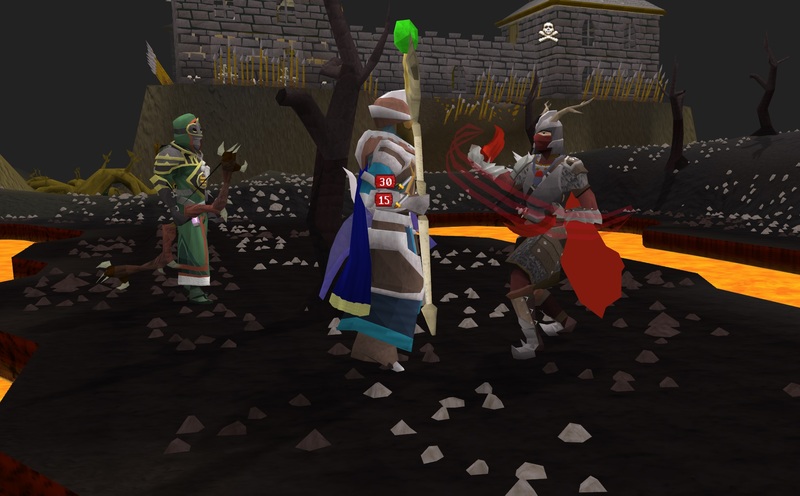 Meaning that turning away from mining a rock or an event occurring forcing you to stop doesn't only cancel your action but also the mining animation in this example. 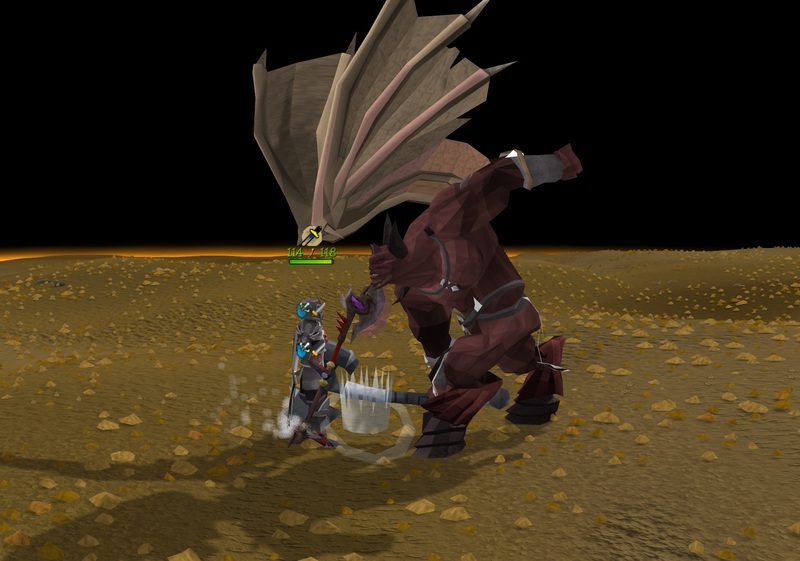 Following monsters have had their drop tables improved: Bloodvelds, Warped terror birds, Cave horrors, Aberrant spectres, Smoke and Dust devils, Goraks, Nechryaels, Dark beasts and Mutant tarns. These drop tables were quite old and outdated and needed additional refinement. Slayer monsters should be profitable kills, especially the ones having a high requirement to be killed. Please allow us some time in order for the changes to appear on the wiki too! Mutant tarns combat behavior improved. The npc now has a size of 2x2 instead of 3x3, attacks faster and received additional attacking distance. This change was done in order to reflect the buffed drop rates. Brutal green and Mithril dragons no longer drop 2 dragon bones. Green brutal dragons now drop 1-4 (was 1) green noted dragon hides and mithril dragons 4-12 (was 6) noted mithril bars. An issue with sending emails to walla emails has been fixed. The provider would not render e-mails if they contained the @ symbol. Halloween event has officially ended. You can still complete the quest and buy rewards, but Skull drops have been disabled. Plank Make spell now completes a full inventory (28) instead of 13 logs in the same amount of time. 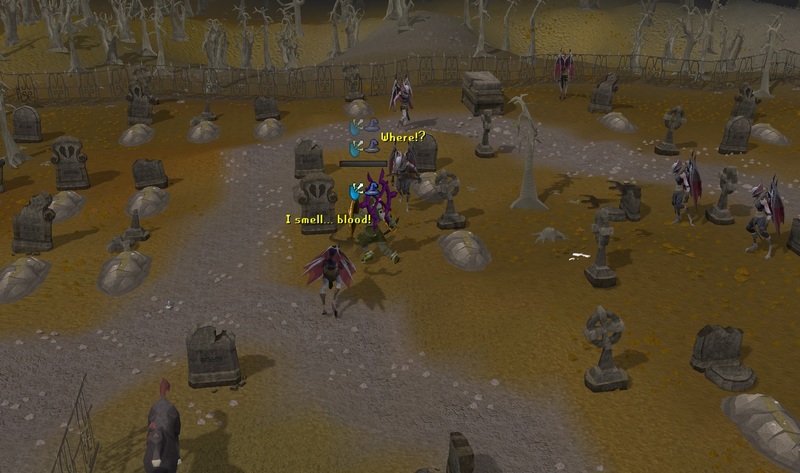 Items lost upon death inside the Barrows minigame are now dropped at the graveyard entrance. Alching valuable or untradeable items now shows a warning. The price trigger to show the warning is currently set at 300k. That means if an item alch value or GE value is above 300k you'll get a warning if you really want to alch the item. The block animation of demons has been updated. Easter ring can be equipped again. Demon wand and orb now correctly degrade upon death. A bug with degrading barrow equipment was fixed. It will no longer be unequipped when processing from 50 to 25 but instead when going from 25 to 0. The worldmap viewer now caches more images. It should thus be less laggy and buggy once fully loaded. The mouse moving speed was also reduced to make sure the area you scroll to can mostly be seen. If you are having performance issues I recommend not zooming out too far and to wait for it to be initially loaded once! Item stacks are now properly rendered on the floor. Prior to the change you couldn't distinguish a 2 arrow drop from a 5 arrow one. Internal color or icon codes can no longer be used in chat rooms. You can still type them in your chat box, but they won't appear to anyone else. Smooth animations have been revamped. They're now properly interpolated and some flickering issues have been fixed. I've also added an option to turn off animation smoothing completely in case you prefer a more older and classic style. Flickering issues have been fixed when npcs are transformed. This fixes a problem where KQ or Kal'Ger turn invisible for a short amount of time. The way non-map objects are loaded into the game has been reworked. Prior to this update mining a rock or cutting down a tree could cause a short flicker effect before the replaced object (rock or tree) appeared. There will be no more flickering issues when new objects are spawned onto the map. The particle system has been extended to allow static spawns through out the world map. The first example of this new particle system is shown at the Grand Exchange - snowing effect. The position transition of head icons has been smoothed. The will flicker a lot less. Gulegas and Aquanites have received sounds. PC portals are clickable again. Present Deliveries have properly been enabled. NPC death animations no longer suddenly stop and flicker. Rest in Pieces quest can now be continued. Repair option in houses now correctly shows the item name. Entities no longer randomly face north after walking diagonally. I've started pushing the emps engine towards its limits and am now offering you even further Rendering Distances! There have also been several performance improvements and tweaks that ensures less lags and smoother loading screens. I want the game run well on toasters while also offering good graphics. The game will now run smoother, especially on multi-core computers. You're now able to set viewing distances of up to 160 - the previous maximum was 100. The map size is now also scaling with the viewing distance. Please bear in mind that large viewing distances are currently only possible on really powerful computers! This requires loading way more data and also more performance in drawing everything. I've also reworked the way the floor is loaded resulting in better loading times as well as increased quality - floor textures loaded in an atlas with anisotropic filtering. Water shaders have also slightly been reworked. The depth calculation was wrong and the blue water didn't seem very natural. Reflections are now also brighter - they were missing a brightness coefficient. I've also changed the clicking areas for npcs that are far away from you. The additional clicking area factor now depends on the distance from you to the entity. Making it easier to click close entities and more difficult to click the ones far away. This can only be felt when playing with large rendering distances. I often miss-clicked on npcs that were too far away and identified that their clicking areas were just too big. There have also been performance improvements that makes it easier for the game client to handle large amounts of models. Ground decoration is now also rendered in a separate call and only the closest models are rendered. Distant grass or rocks on the floor are no longer rendered when too far away giving you less performance loss at large rendering distances. The NPC death animation system has been reworked. I have taken the timers from the actual animation configuration out of the client to determine how long an animation takes. Monsters should no longer have flickering death animations and will now drop their items exactly when the animation ends. Some monsters may drop their items sooner and some later after this patch. I have also fixed an issue where an npc would still be alive for 1-2 seconds until starting to play the death animation. The timer is now between 0 and 1 second depending on the death animation duration. Please also bear in mind the server needs at least 1 tick (0.5s) to determine and flag an NPC as dead. So that's the minimum amount of time a death animation needs to be delayed. I've also added an additional delay to the death animations of KQ and Corporeal Beast to ensure they don't get stuck between a walking and death animation. Aggression radius inside Fight Caves has been fixed. Sometimes npcs wouldn't walk towards the middle in order to attack you. The drop system has been rewritten. It's now internally based on the player's name instead of the player's id. That fixes a problem where people would randomly get the drop of another person when logging in and receiving a recycled player id. Har'Lakk minion spawns have been tweaked. They should no longer stop attacking you and thus also not stay alive when Har'Lakk dies. The amount of vials in the General store have been increased. I cannot put noted vials into the store, because they could simply be bought in 1 go, making the shop run out of vials constantly. I am still thinking of solutions to be able to obtain more vials though! Vyrewatch necklace (b) no longer turns into dust when lost. KBD's defence level has been lowered from 145 to 135. It's supposed to be an easy boss for medium levels and may be too difficult to kill with low-level gear. The game is now listening on ports 23 and 24 again. This means that connecting from school and uni networks should be possible again! Water planes at Aquanites have been fixed. Brightness setting has been fixed. Issues with clicking NPCs has been fixed. I'm continuing work on wilderness updates. There will be a new boss and also a new fishing spot. I'm trying to keep Trello as up to date as possible: https://trello.com/b/QGPVa5en/emps-world Bear in mind it's a flip chart and nothing in there is guaranteed to be in the game! Today's update mainly focuses on fixing a few problems and introduces PvP Highscores. It's been a while since the PvP ranking update was applied and we've now also collected enough data to properly display rankings on the homepage. 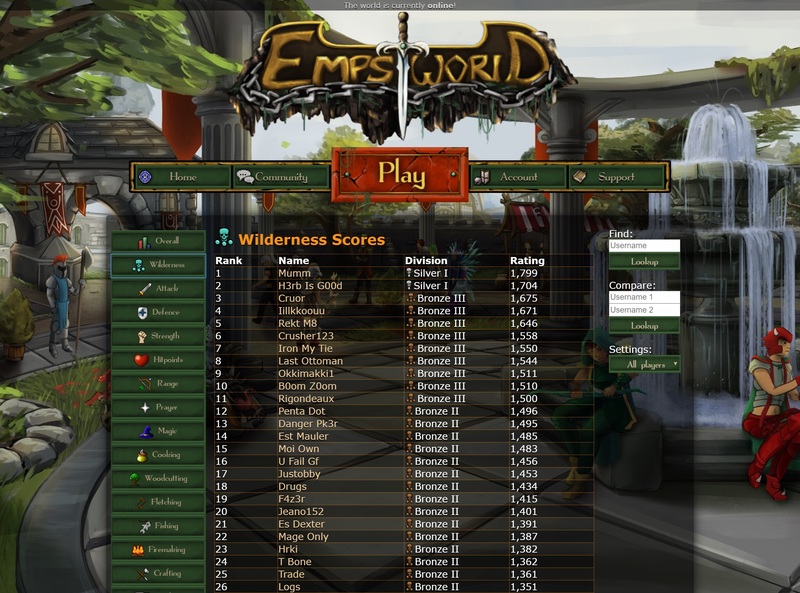 You can have a look at PvP ranks here: https://emps-world.net/hiscores#skill,Wilderness,0 With this update I've also overhauled and modernized the Hiscores page. You don't need to download the new loader, the old one will still do fine. The overload refresh effect has been changed, because it was a problem in PvP and also completely negated any stat reduction effects from any monster. Don't worry, overloads still restore your stats and they can still be used with brews, but the effect has changed a little bit. Overloads now restore up to 6 levels every 4 seconds instead of a full stat restore every 5 seconds. Nothing changes if you take 1-2 zips of your brews, because your stats will be restored immediately. In fact it's even faster than before if you only take 1 zip. So unless you drink your whole brew at once this is a buff. However taking damage of a bgs special attack or drinking 2 entire brews in a row won't be recovered that quickly. My point here is that I don't want to completely counter stat reduction effects by just having the overload effect active. A bug with void equipment bonus not showing has been fixed. Overkill in PvP scenarios has been re-enabled. It shouldn't be possible to tick eat and avoid all incoming damage. I've made a mistake here and am sorry. Blessed dragonhide vambraces and chaps now require level 1 Defence and have had their defensive bonuses adjusted. Tyras Guard at the Grand Exchange now has a teleport option to Fight Caves. The experience gain for spellbook teleports has been increased. Berserker necklace now boosts obsidian claws damage. Mithril dragon and green brutal dragon Defence levels have been reduced. Broken virtus body is no longer untradeable. The kill counters which determine who gets a drop in a PvP fight are now reset when leaving PvP combat and no longer when leaving combat at all. That means that whenever a fight between 2 players ends the kill counters are reset and the next fight will determine who gets the drop. Ghost captain can now be found west of Barbarian village offering a teleport to Canifis. Falador teleport has been re-added to the quest tab interface. Double death trigger is no longer possible when healing after already being declared dead. The cooldowns for fighting the same opponent in wildy to gain ELO have been increased. Multi spells are now correctly hitting again in PvP. A bug with the quiver has been fixed that allowed you to create arrows. Messages can no longer start or end with spaces. That should fix an issue where a space in front of a clan chat message or command won't let you type it. Water that is no longer in camera space is also no longer rendered: frustum culling for water. I'll now start working on several new wilderness activities. We have a new amulet planned as well as a new boss that drops new equipment. So stay tuned! 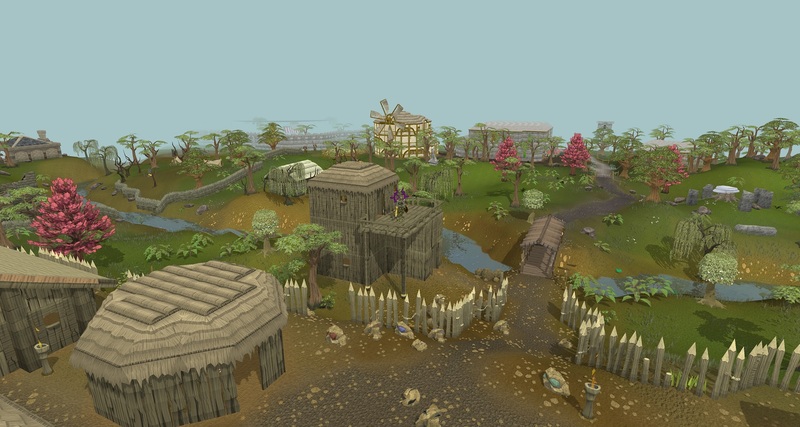 The experience boost is also extended onto minigames and the wilderness. Giving you double minigame tokens as well as double blood coins for kills! What skills are you going go train? Vanguard, Trickster and Templar bonuses buffed. These sets now give higher accuracy and strength bonuses than before. It's now in between third-age and bandos. Trickster 5 piece set buffed: You now stun your opponent for 2 seconds instead of 1.5 for every auto attack. Anti PvP cheat system improved. There is now a cooldown timer on every person you kill. If you keep fighting the same person in a short amount of time you'll gain significantly less blood coins and elo. I don't want to annoy anyone doing this but it requires a limit to avoid win trading. The combat experience gain BEFORE LEVEL 99 has been decreased from 40 to 20 experience per hit. It is a little problematic, because in-game progress is too slow compared to combat experience gains. This leads to high level accounts not having appropriate gear for their progress. This isn't a final solution, but we'll be trying it out in the coming weeks. Gilded items from voting boxes are now broadcasted. Kal'Ger can now be assigned as Slayer task. Reset lamps have been fixed. They now properly reduce your skills again. Skull head icon no longer disappears when leaving the wilderness but when the timer runs out. The wave in Fight Caves no longer proceeds when logging out. Ranks in clan chat can now be changed by Captain or higher instead of Lieutenant or higher. Battle axe special attacks were fixed (corrupt & normal). The standard teleport animation now looks smoother when teleporting into new regions. Certain data holders in the client have been updated to use less memory. This improves overall performance and memory usage, especially on longer Rendering Distances and in crowded areas. For those of you who are interested what changed: A lot of arrays were ints, which used 4 byte or 32 bit per entry. That precision wasn't always needed, because a lot of numbers didn't go higher than 10,000 anyway. I have changed those arrays to be shorts, which require 2 bytes or 16 bit per entry. This costs less RAM and allows your CPUs cache to load more entries per call speeding up iterations over these arrays: animations, loading models, saving colors, etc. Smoothness of compass and minimap have been improved. They are now anti-aliased when rotated and will no longer flicker or have white artifacts. 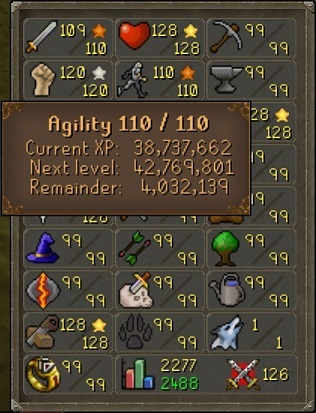 Rune requirements now properly in the autocast interface. Today's update focuses most on re-balancing the combat triangle and equipment bonuses. We aim at making items more popular for PvP and easing the combat triangle giving you more Defence bonuses against your weaknesses. Special attacks have also been buffed and the early / mid game progress was made faster by improving certain drop tables and combat experience gains. 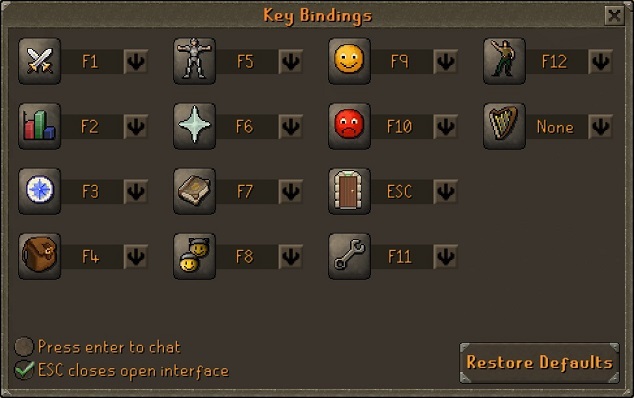 As most if you have probably already realized, you are now able to bind your F keys to menu tabs. There's also an option to enable pressing enter before being able to chat. This mode allows you to use wasd for camera movement and qe to zoom in and out. You can also enable the option that pressing ESC closes the current open interface. Moreover, it's now also possible to lock your combat experience. You can still see experience gains when enabling this option though. I'm sorry, but I have to admit that this mechanism was bugged... for really a long time. Damage was never soaked and this patch aims at fixing the issue. Before the update damage soaking was a quadratic formula of your maximum defence bonus, which imo is a really bad way of doing it. Your maximum defence bonus now gives a flat soaking bonus. Due to the release of new equipment and their maximum defence bonuses, I have adjusted the maximum damage soaked a little bit. It's now properly working but less than it originally was meant to be intended. We have identified that it may be too difficult to progress in early stages of the game. Thus we want to buff the drops of beginner level monsters to make it easier for new players to make money and to obtain useful items. Starter sets have been replaced with real item sets: Iron armour, hide and blue wizard robes. Drops for monsters around Barbarian village have been massively buffed: Barbarians, Goblins, Wizards, Archers, Hill giants, Moss giants, Tower Archers, Guards. They now drop items up to rune, more coins and larger quantities of resources. Monsters found inside the Barbarian dungeon have had their drops buffed. Quantities were increased and rune / dragon items were made more frequent. Dragons now drop dragon items more frequently - the chances were doubled. Slayer Tower drop tables overhauled. 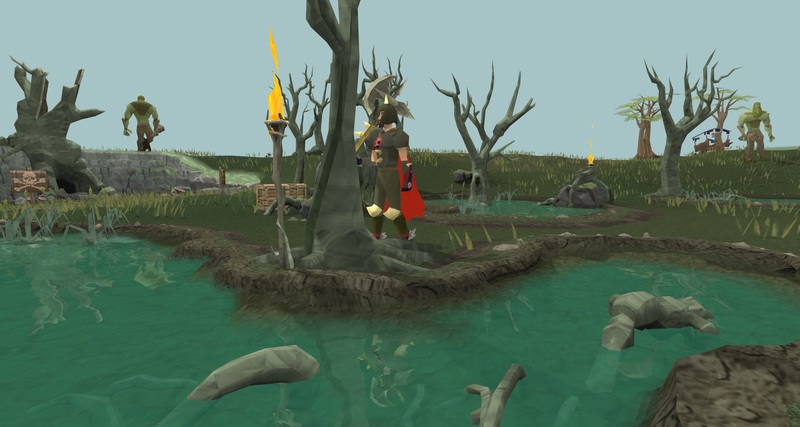 The Slayer level requirement is now taken into consideration and improves the droptable. Overall you will be getting way more valuable drops from monsters inside the tower. Thieving npcs now gives more coins. New players now get a randomized look instead of the standard one. More starting items are added to inventory after completing the tutorial. Let's just say I was wrong - 20xp per hit are way too low. 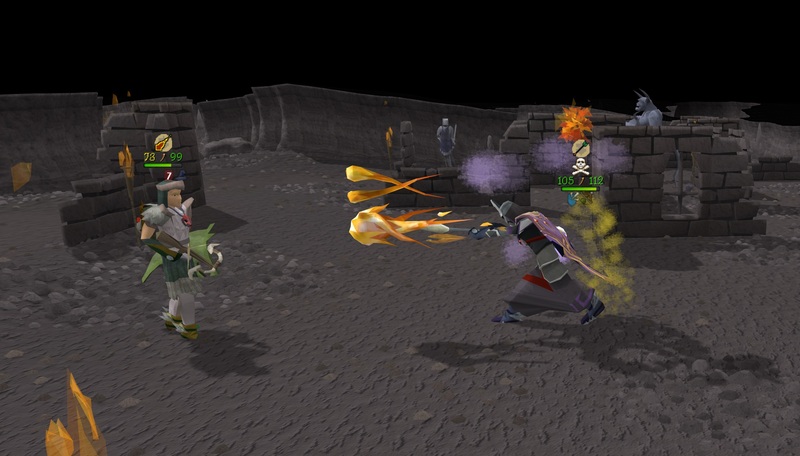 We are changing the combat xp rates back to 80 xp per hit. Progress shouldn't be that slow and frustrating in emps. Afterall most of our content is designed for end-game and that should also be achievable in a fairly normal amount of time. The whole experience gained thing before and after level 99 has also been removed. It's always 80 xp per hit. What does that mean? If a melee equipment piece gave 100 defence bonus, you'll get +100 range defence bonus, +75 melee defence bonus and +50 magic defence bonus. I've adjusted the fishing timers a little, because the catch rates felt a little bit clunky and the amount of fishes obtained were just way too much on higher levels. I've made the catch rates faster on early levels and let the level have a little less of an impact later on. Catching sharks with 70 fishing for instance doesn't feel like you're getting a fish a minute anymore and you no longer get a fish per 2 ticks when having a very high fishing level. The speed curve of catching fishes is scaling better now. To cope with that change in fish gains all their experience gains have been doubled. You'll have to bank less often and will still gain the same amount of experience in the same amount of time. I have recently prepared a system that makes it really easy for us to keep stats of items up to date on the wiki. We will be testing the system within the coming weeks and see how well it performs. If this makes overall wiki updates easier I would also like to enroll the system on NPC data: stats, drops, attack speed, etc. So you'll always be able to view the exact in-game stats on the wiki too. The accuracy bonuses of Infinity robes have been buffed and received a little strength bonus. Mystic robes received a slight strength bonus. The book of balance now gives Ranged strength and accuracy bonuses. You no longer lose as much ELO when losing a fight in the wilderness. It currently is too difficult to reach higher ranks, because you only rank up by only killing others. You can now also improve your ranking by just participating in many fights. Accuracy bonuses of defenders have been buffed by 25% (dragon defender +20 --> +25 accuracy). Defenders were a little bit weak when compared with a dragonfire shield or other alternatives. Overkill damage no longer exists and thus tick eating is now possible. That means eating at the same game tick when lethal damage arrives let's you live through it. Multiple incoming hits are no longer stacked as 1 big hit. This is only a visual change, because I have received complaints about people dying in 1 big hit. This was correct, but the large visual hit coming out of nowhere was a little odd. God robes now require level 1 Defence to be worn and have had their defence bonuses lowered. God cloaks now have equivalent stats to god capes: +5 magic accuracy and strength. Their level 25 Prayer requirement stays. Corrupt PvP items have been moved to level 40 Defence. That doubles their defence and accuracy bonuses, strength bonuses remain untouched. Multi combat spells no longer have an experience gain punishment: Barrages and chin chompas. Donator blades have had their attack speed increased. They now have the same attack speed as saradomin sword, scimitars and whips. Korasi's sword special attack now costs 50% special energy. Splitbark robe parts now give additional magic strength bonus. Comp ogre bow Range requirement increased to 71 - it can now shoot Barrow arrows. The experience boost of brawling gloves has been increased in the wilderness. They give 200% experience in the wilderness and 150% outside of it. Zamorak godsword freeze has been increased from 20 seconds to 25. Bandos godsword now also reduces the enemy's prayer points by 25% of the hit. Overloads can now be noted and traded. Dragon and onyx bolts now require level 61 Ranged to be used. That means you can use them with a rune crossbow. Saradomin: 50% of damage is drained from enemy prayer points. If attacking an npc this reduces their defence level by 50% of the hit instead. Zamorak: 50% of damage is drained from enemy defence level. Guthix (not yet available): 25% of damage is healed. The additional passive perk increasing damage of using god arrows with their appropriate bow has been removed. They now have flat bonuses equal to barrow arrows and can also be used as such by other bows. Demon saber and halberd now properly break when lost upon death. The charges of newly created elemental weapons have been increased from 5,000 to 30,000. This change brings elemental weaponry more in line with Demon weapons. Demon longbow has received +12 accuracy and +2 strength bonus. When comparing it to the demon crossbow it looked a little weak. Demon orb has received +4 accuracy and +4 strength bonus. It should be more a little useful as offensive stat booster while giving 0 defensive bonuses. Removed the strength level requirement for several items: Vesta, Statius, Godswords, Zamorakian spear, Demon saber & Halberd and Saradomin sword. Saradomin sword and obsidian claws special attack now hits 1 game tick earlier. Spectral energy drop rates doubled. You just need way more energy to charge equipment than there currently is in the game. Ancient statuettes from Revenants now have double coin value. We would like to make killing dangerous foes in the wilderness more valuable. A bug was fixed where runes from the rune bag would no longer show up after casting a teleport spell. Ghostly roves now give magic strength bonus. Accuracy of all special attacks has roughly been increased by 25%. Most special attacks have an accuracy boost of 25% while godswords and other high level weapons gain 75% - 100% accuracy boost. All bosses (the ones that count for daily tasks!) now have drops for the top 3 damage dealers. That includes all GWD bosses, Dagannoth Kings, Corporeal Beast, Kalphite Queen, King Black Dragon, Chaos Elemental and Smoke demon champion. Group bosses still reward the top 4 damage dealers. The Tower key required to access upper parts of the Slayer Tower can now be found in wardrobes inside the Slayer Tower. Banshees can now drop a creeping hand pet with a drop chance of 1 in 1000. Party hats strength and accuracy bonuses increased. Composite bows now have the speed of shortbows. Magic longbow, magic composite bow and demon longbow have received a special attack. It costs 35% special attack energy and is guaranteed to hit the enemy. Demon halberd now shares the dragon halberd special attack. Torags received additional Defence bonus while reducing its accuracy a bit. A bug with the dark bow special attack was fixed that would reduce its maxhit. Texture atlases now use 4x anisotropic filtering (only if your GPU can do it!!). This effect makes textures appear less blurry and more realistic when viewed at specific camera angles. I have decided to not make this a setting, because the performance cost is non-existing for low resolution textures in emps. This update mainly consists of balancing and overall improvements for the game. I want to make certain items more useful for PvP and give newer players an easier start for the game. With the amount of PvP ELO data available I'll also soon be able to put Hiscores online where you can lookup ranks. Barrows equipment charges of newly used items increased from 8,000 to 20,000. I'd like to bring this more in line with other equipment charges. Revenants droptables overhauled. Statues are worth more and drop more often. Third-age drop rates have also been adjusted. Statues and third-age drops are now also always broadcasted. Amulet position now depends on the platebody model. This fixes an issue where amulets would be invisible on certain armours. God robes now share monk robe's prayer bonus. Dark bow special attack speed increased. The projectiles now fly and hit faster. Reset lamps can no longer be used when items are worn. Unnoted overload potions can now be traded. An issue was fixed where you couldn't hit through protection prayers when your enemy had low hitpoints. NPC defence bonuses have been fixed. There was an issue that globally gave them 15-20% higher stats. KQ and Corporeal beast now properly drop items for the top 3 damage dealers. The charges of newly used spectral equipment have been doubled. Repair costs stay the same. However the amount of dropped spectral energy upon a kill can now be higher due to higher maximum charges. Crossbow limbs now have an alch value. What do you think about it? Let me know if you'd enjoy similar videos in the future? I was thinking of creating videos that show some of our bosses? Special thanks to Crusher123 for making the video and Jhonson101, JP, Namnori, Iron Corne, Jandar for preparations in order to take the clips. Many many thanks! Update Notes / Updates August 2nd 2018 - Wilderness Revival, Ranks, Oldschool News and More! I hope you are having a great summer time. It has taken some time, but I have finished a gigantic PvP and balancing update. I aim to find a long-term solution to revive and keep PvP active as well as making it attractive to participate in. I have also overhauled some older systems and fixed a ton of bugs. Last but not least, I have and am still working on an option to turn the current game into oldschool style with only a mouse click! PvP crates: Food, potions, selected runes, edgeville teleports and PvP armours. Rune bag: Can store 3-5 (member benefit) runes and CAN be equipped in Arrow slot. Quiver: Can store 2-4 (member benefit) arrows / bolts and HAS TO be equipped in Arrow slot. PvP armour pieces: In case you are unlucky and have a lot of blood coins, you can also buy them directly here. Bear in mind that getting the armours through crates is much much cheaper though! Please bear in mind that the higher ranks are aimed at people who are supporting the game through many months and years! Veteran: How many years you've been playing Emps-World. We cannot go back in time and copy the registration dates of the Emps-Scape, so no registrations longer than 4 years ago count. Staff Icons: You will find different mod / admin crowns. Icons also appear when right-clicking players now. They can be changed at any given point to any image leaving us a lot of space for future changes and improvements! The aim of this change is to make running longer distances more complicated. Outrunning somebody in the wilderness is now possible, especially when having a lot of loot in your inventory or wearing heavy armour. Please don't worry though, this isn't going to affect skilling a lot! You get your run energy fully restored by talking to a Healer. I've updated the system to support the usage of proxies and also configurations behind firewalls. The old system was doing an IP comparison of your game login and on the homepage. So voting on your smartphone and trying the claim the points in-game wouldn't work. You should be able to claim your points no matter where you vote now. It's based on your user OR ip address. If one of them match, you can claim your voting points. Grand Exchange now correctly displays the correct amount of coins you get for selling items. Barrows slayer task amount is now dividable by 6. Meaning you never have a left-over round during a task. Rewards potential interface in Barrows now correctly resets when claiming the reward. Bolkoy dialogues have been updated. Redberry pies can now be eaten. Double agents can no longer be attacked by other players. Cure plants spell now has a timer and only gives experience when you successfully cured plants. You also gain some farming experience when successfully curing plants now. Chaos dwarves can no longer be assigned as Slayer task. A bug with Spectral equipment was fixed. When dying with a fully charged item (e.g. Zuriel robe top) you wouldn't get any Spectral energy. Skull timers have received second precision instead of minute precision. Your skull is now consistently 10 minutes long instead of something between 9 and 10 minutes. Moreover, there's now also an orb that shows your skull timer. The timings of Jad's animations have been improved. Items lost in the Kalphite Queen boss chamber are now dropped outside, before you use the rope to enter. Levelup messages now properly tell you new activities that you are able to do. This is a copy of the skill advancements tables. Slayer tasks can now be extended (doubled) for 50% of their Slayer point reward. A bug was fixed where resetting skills with xp lamps wasn't possible anymore. You can now properly complete puzzle clues on Farming patches. The experience reduction for multi hits (range & magic) has been changed to 50% from 20%. The previous experience gain nerf was just too much. Spectrals now hit more through protection prayers. They were never intended to be fully blockable. Skipping the tutorial now warns you about not being able to become an ironman account and gives you a starter set. The range starter set now also includes 100 bronze arrows that are equipped. The charges of coal bags have bee increased from 1,000 to 10,000. This doesn't apply to current bags but new ones! Weapon poison (p+) and Weapon poison (p++) can now be made with the Herblore skill. Ranging and Magic potion have been added to Herblore. A new Slayer master called Turael has been added to the Barbarian dungeon. Turael assigns solely monsters found in the dungeon and is for beginners. Void knight elite defence bonuses have been a bit too high. We found out when testing the defence bonuses of the PvP armour sets. I have reduced the defence bonuses of elite void knight top and bottom by 10%. You won't really feel this change, but it's now more balanced and aligned to existing content. The rendering distance for players and npcs inside minigames has been increased. Fish monger now sells Varrock, Lumbridge and Falador teletabs. It's still worth it to create those through Construction, because they can only be bought in low quantities. Snape grass can now be found around the river of Barbarian village. Barbarians, Mages and Goblins now drop Guams, Marrentills, Tarromins, Harralanders and Ranarrs. This allows new users to find and create low level potions with all resources found in and around the Barbarian village. Stepping stones in Emps-Wars can no longer be clipped by following. That counts for npcs and players. A bug was fixed where certain tops would make your arms disappear when wearing dragonhide bodies. Sky is now reflected in water and the underwater color depends on the surrounding terrain. There's now also a depth calculation that determines the transparency of water. Basically giving you a better immersion of how low underwater terrain is. Items shown in the chatbox (skill advancements) are now more centered and larger. Images are now loaded on demand and no longer need to be downloaded before starting the game. This improves initial loading speeds by roughly a minute. It's annoying when joining the game for the very first time to wait for long downloads. Underwater terrain is now properly refracted. That means that underwater objects are now also having a ripple effect. Upgraded abyssal weapons have received animated textures. They were originally supposed to have such kind of a glow, but due to engine limitations it wasn't possible. Camera system has completely been overhauled. It felt very outdated compared to other games. Camera movements no longer have a delay / fade-out effect but is a direct representation of your mouse movements. To make sure nobody is displeased with the change you are now also able to select 5 different camera sensitivities. Scaled images now look smoother. You can now select fullscreen mode from the game settings. Skill interfaces no longer have empty buttons. I've cancelled this project a while ago and also won't revitalize it. 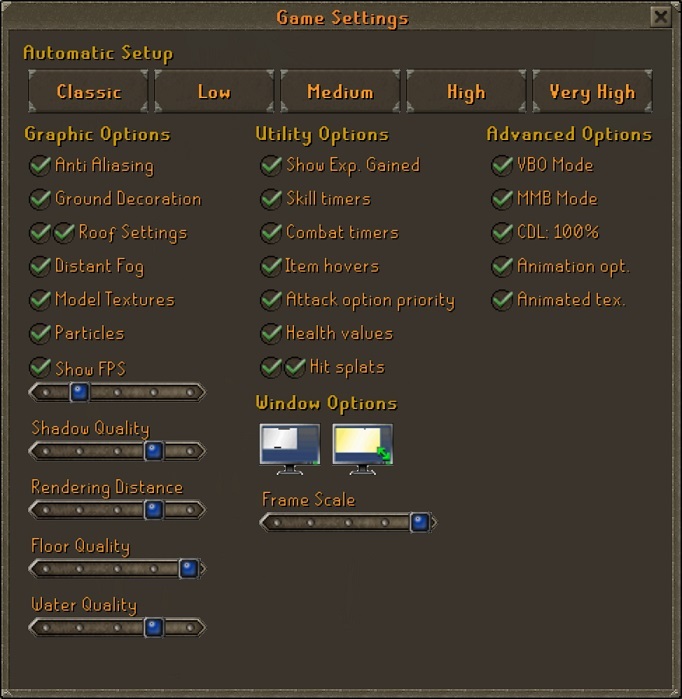 However I have been and am currently working on an optional oldschool option, which will give the game an OSRS feeling. This replaces (wherever possible) player and npc data with their oldschool variants. This overwrites their look and animations. It's impossible to replace the map with OSRS data, because their positions differ. I can add new maps though, including Zeah, Zulrah, etc. I'm also able to use all oldschool items, such as the blowpipe, elder maul, twisted bow, etc. I want to finish the graphics option first though before adding such content! Update Notes / Updates May 20th - Kal'Ger Group Boss, Voting, Daily Activities and SEO! A new 4-man group boss challenge awaits! The lair of Kal'Ger can be found deep down in the Barbarian dungeon. It is highly recommended to initially fight the boss with 4 people to learn the mechanics. Good luck on beating him! It may be difficult in the beginning, but once you learn the mechanics it's easier. You also benefit greatly be using a dedicated tank in this boss fight, because a tank can mitigate a lot of incoming damage on your team! Beginner box (5VP): Weapons, armours, resources, teleports, etc. Adventurer box (6VP): Weapons, armour, food, potions, ammo, etc. Veteran box (7VP): Skilling resources, xp lamps, runes, etc. Rare box (15VP): Contains 1 Beginner, 1 Adventurer and 1 Veteran box. Each box can contain the rare gilded items! We will put the full reward tables onto the wiki as soon as possible. Thumbnail images on the front page for news, screenshots and the background. Removal of inline css and old html tags, such as <center> or <font>. The changes above greatly reduced site loading times. It will be faster and thus be ranked higher for search engines. It's also less likely for people to leave the page during the initial loading time. Image and link description tags when hovering over them. User-friendly and readable forum urls. Don't worry, you can still use the ::forum command in-game to get topics. The number after the hash symbol (#) displays the topic id when browsing the forum. New Play Button popup with proper Windows, Java and MacOS icons. Player counter always visible and lazily loaded once player count is available. Main page background lazy loading: Thumbnail loads first and full quality fades in when complete. Minifications and page load speeds apply to the main page (https://emps-world.net) only. The forum is work for another time. I also doubt it's worth the change, because the initial page landing is always on the main page, rarely ever the forum. I've been thinking about this for quite a while and am now implementing it for 4man group bosses. You gain additional viewing distance on monsters during these fights. This will make it easier to spot bosses on larger terrains. I plan on giving you a setting to manually increase the npc and player drawing distances outside of boss rooms. This won't work in the wilderness though! Medium: Black demons, K'ril Tsutsaroth minions. Appropriate drops have also been added to all GWD bosses and Nex. The activities above are listed in ascending difficulty, which is reflected by your combat level. You can get the Duel Arena activity at level 45 combat and the group bosses are assigned for combat levels of 120 or higher. Additional 10% stackable drops: coins, noted items, seeds, etc. I've had a little chat about this and thought about possible flaws with these boss fights. They aren't as popular as Nex, because the fight takes much longer and the drops are comparably worse. I'm increasing the drop chances for Demon weapons from 0.6% to 1%. Resource drops have also received a little overhaul increasing their stacks and replacing some items that aren't very valuable. Overall the reward for killing these bosses has been increased. Another offsetting issue was fixed, which was causing players to not see each other when having awkward timing during teleports. Random events can now happen only once every 15 minutes are and much rarer. Health regeneration is now disabled during duel arena and death animation. A lucky regeneration tick can no longer protect you from death. Equipping Hunter skillcape now activates the skillcape emote icon. You can no longer spawn 2 Barrow brothers when passing through doors. A door orientation bug was fixed at the south-western Barrows room. Colored abyssal items have received an additional level 72 tier. Meaning that if you have level 72 Attack, Ranged or Magic colored abyssal bows, whips and staves now give +3 additional accuracy and +2 additional strength bonus. Duellist caps can now be operated and will play an animation. Rod fishing animation is no longer constantly replaying. All fire giants now drop big bones. A bug with decanting noted and unnoted potions has been fixed. In some scenarios the Decanter would handle a noted potion stack as a single item and thus delete the entire stack. I'm sorry for this, it's fixed now! A bug with the combat power of dragons has been fixed. Some had a Magic level of 0 resulting in them not hitting anything with the dragon breath. Droptables of Ancient gladiators, Ice demons and Abyssal watchers have been improved. All drops are now noted and drop amounts have been increased. Finishing a potion no longer adds an empty vial to your inventory. Void knights can no longer be attacked with magic. Hatchling dragon drops are now Dragon eggs. The egg can either contain a Hatchling or Baby Dragon. Where Baby Dragons are new and are larger than Hatchling Dragons. Clan chat messages now receive line breaks when they are too long. Water can no longer pop through the ground in Catherby. Zombie green skin color and ancient wings lilac have been added to the character design screen. Character design screen updated. Some torso models have been bugged and were flickering. Loading process improved. Objects close to you now have priority when the map is loading. This is the first step towards really large rendering distances. The process has also been put into another thread, meaning that multi-core processors can now load the map without affecting fps too much. Daily, Weekly and Monthly Highscores with rewards for the top ranks. ELO system: Separate rankings for Wilderness, Duel Arena, Emps-Wars, etc. There will be also rewards depending on how high your rank is. I'd also work on a PvP shop that provides you with supplies when fighting players in the wilderness. Activity counters: e.g. how many times you've participated in a minigame or how many tasks you've completed. A lot of text this time, but there's been a lot of changes! Many thanks for reading. Voting issues: It's a bit confusing and I've already got a little overhaul coded. It will work on IP addresses rather than on usernames. So VPNs will work and the homepage can always correctly tell you if you've already voted or not. I've also found an issue where voting points aren't saved correctly. Terribly sorry, but it's already getting a fix! Kal'Ger dropping items outside of the boss room. Clicking areas on the floor when moving around. Spectrals and Warriors Guild spawns fixed. An issue was fixed when planting herbs and mud patches would still stay. An issue with rendering shadows and water was fixed, which caused parts not to be taken into consideration for processing. So places that were actually casting shadow or reflected objects wouldn't show. Demon saber and halberd now require level 85 Attack and Strength to be worn. Requirements are also shown in the skill interface now. I'm writing this thread to get a better idea of what features the community is interested in and how to make the game more enjoyable. I'll be also criticizing a few things that I think have been done wrong and could be improved. It's really no big surprise that the genre of emps makes it really difficult to attract new potential players, because RSPS in general is having a really hard time thanks to OSRS. I still don't think that we're at a critical point, although you sometimes see only 30-40 players online. We still have daily peaks of 60-70 and close to 300 unique computers that visit the game daily. If you compare it to the old days, then yes, it may be a lot less. But please bear in mind the old days had no OSRS, which is peaking at Idk 100k players or so right now? That's lots of players! I've seen this coming up a few times too, so I'll leave a short comment here. Just because the game had more players 5 years ago and the graphics were different doesn't mean that changing or reverting something will also attract tons of players. Correlation does not mean causation! Besides... if you put the graphic settings to minimum, you're basically running an oldschool game. Maybe I'm doing advertising wrong, where I should also put oldschool images into ads instead of high quality ones. I'll have a look at that. Reduce experience rates in general. I feel that combat xp especially is too much. I could also see reducing the experience rates of gathering skills. I'm not going to change that unless I get lots of input! Reduce resources gained from Woodcutting and Fishing. To be fair, you get an inventory full of fishes in no time after a few levels. I would like to re-balance this. No medium level content. There's literally no bosses for medium levels with bad gear. I think that this issue could be resolved by lowering the experience rates though. Low level content: I'm having a rework ready for the Barbarian dungeon to give newcomers an easier start and more monsters to train on with useful drops. So I think that shouldn't be a problem anymore. High level content: I think that this is the least of an issue, since there's lots of bosses with many drops to collect. There's also difficult bosses, such as the 4-man group challenges, which have been a great success imo. Working on the 4th boss right now. Daily activities: Currently we have daily tasks that are only skill related though. What would you think of daily boss or minigame tasks? I also only see this working out well by adding additional items to the EP shop. Open for suggestions here! Game modes with lower xp gains: I've seen this idea come up, but I don't really think it is that great of a solution. You'll just be creating different account types. However... I could this see potentially becoming interesting, because it will give veterans a new reason to play the game. What could be potential rewards in that game mode? What about receiving an oldschool rare when being maxed out as reward? Let me know! I somehow feel like the model of paying for content is outdated. What would you think of removing all game content that is locked behind member? I think that it has enough benefits, such as getting more bank space, GE slots, 10% xp boost, etc. So locking certain skills doesn't make much sense for me. I could see this change being very interesting for Slayer. Thoughts on that? What would you like to see as new large feature? I have the idea of summoning, but there's also other things that could be done. Maybe longer quest lines? Let me know! Thanks for taking your time to read this. Please leave a comment below telling me what you think. Feedback is very valuable to me and I enjoy reading your ideas. Update Notes / Updates April 20th - Virtual Levels, Membership changes and Barbarian Dungeon! Quite a long list of changes this time. I'd say Virtual levels and Membership are the biggest changes, but you'll also find the Decanter and Experience lamps as rewards for daily tasks useful! Baby blue dragons received a droptable. The screenshot below shows how the skill tab interface with virtual levels enabled looks like. The green total level shows your virtual total level, which can go up to 2,944 when being completely maxed! Entrance to Al-Kharid and the Desert. Fletching bolts and bolt tips. Agility obstacles & dungeon entrances. More space for your house. This sounds like a drastic change, but I really feel that it's a good step towards making the game feel more enjoyable. I will update the list of member benefits to make sure it's clear what you get with the package! You now get a Combat lamp by completing combat related daily tasks (no Slayer). You can choose in which combat skill you want to gain experience. The experience gain curves were taken from RSWiki and interpolated. It's not an exact copy, but very similar rates. The task system was also updated to use the same experience curve. That means that lower level tasks gain less experience and higher ones more experience. The turning point is at about level 60 if compared to the previous system. Moreover, I've also added these lamps as rewards to the EP shop. Lamps are not affected by any experience boosts but membership! You can now decant potions in any possible variation you wish. The mechanism works with noted and unnoted items and always costs 1,000gp per inventory. You have predefined options to decant potions into 3 and 4 sips. However if you wish to decant them into 1 or 2 sips (maybe 5 or 6 in the future?) you can use the Decant-X option to do so. I have also increased all amounts of noted item drops to make sure this boss is worth killing. I was able to identify and fix an issue with our mail server postfix. The hostname that it was sending was incorrect, which resulted in some mail providers rejecting our mails completely. I've patched it and there should no longer be mails that aren't delivered. If you are still having problems with the mail system or aren't receiving e-mails, please make a helpdesk ticket and I'll have a look! Granite shield alch value increased and noted version added. NPCs around Barbarian village now drop talismans. A clipping issue around the Kalphite Queen entrance was fixed. Thrower trolls now count towards the troll Slayer task. A bug was fixed where opening passable doors while the map was loading wouldn't show. The slayer experience gained for group bosses has been increased. The prayer experience of bat bones was increased from 90 to 150. Swapping two special attack weapons no longer resets special attack activation. Fancy and Fighting boots can now be found on the Grand Exchange. Bolt effects (only 1 word) are now shown in the equipment interface. The full effect can be viewed by hovering over the bolt item. 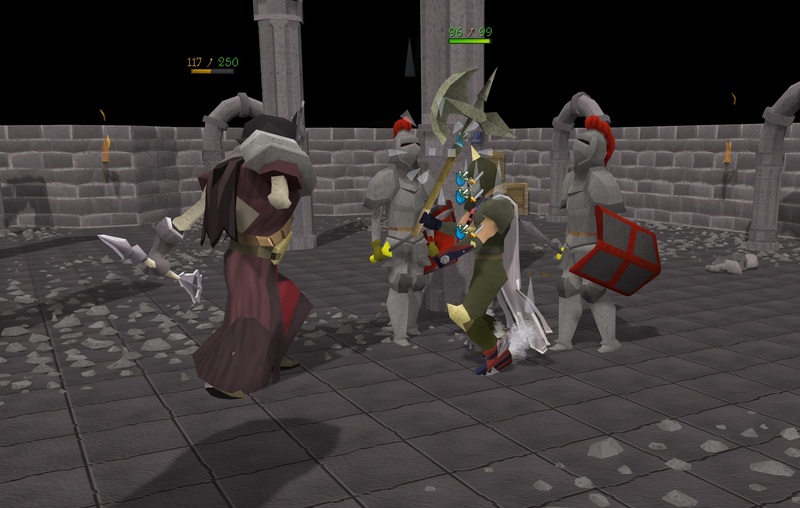 The weapon animations for dharok's axe, anger battle axe and anger mace have been updated. The previous versions were a little buggy and I found a set of animations that fits their style better. Multi target spells no longer increase their range when attacking larger monsters. Also a bug has been fixed which allowed you to target enemies with multi target spells through walls. 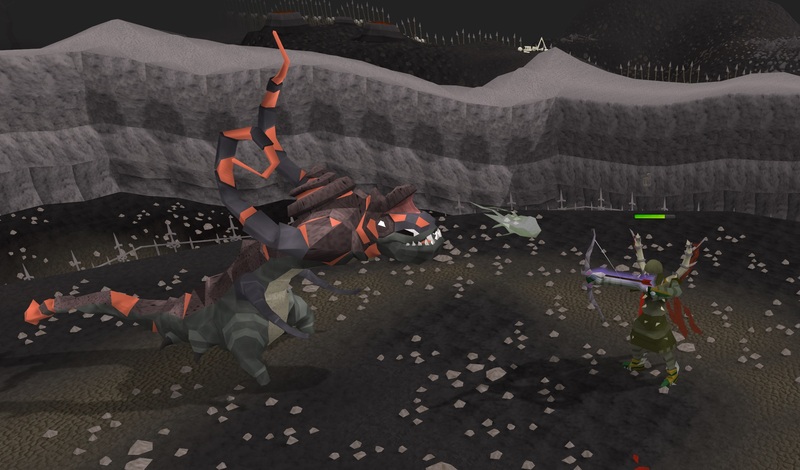 Pet dragons can now be found in the GE. The performance of rendering players on the minimap has been improved. The code that determined if players are in your clan chat or are on your friends list had horrible complexities and were costing some fps. All fixed and improved now though. A bug was fixed where the minimap wouldn't update properly when crossing Agility obstacles. Animations are now properly preloaded when equipping items. This fixes an issue where equipping a 2h sword and walking would shortly pause your walk animation because it wasn't previously loaded. Ground item system improved. You can see up to 5 different items now and all doubles are filtered. So if you drop coins and 10 mantas on top of it, you'll be able to see 1 manta ray model and 1 coins model. This will make it easier to see which items are on the floor. I've given the water calculation an additional depth test that determines how transparent the edges are. It creates smooth coastlines giving water an even more realistic look. I've also updated swamps, because dirty water has very dithered reflections. Voting system: already got the scripts working really well, now looking into the rewards. My plans are to create voting boxes, which contain random useful loot and a rare chance to receive unique pets. My aim is to not let these rewards affect the economy at all but it should be worth your time. Probably dyes for existing items that are tradeable and small experience lamps. Thoughts on that? Daily minigame task: I'd pick a different minigame every day that is featured, so teaming up becomes easier. Daily boss task: An additional challenge once having reached a certain milestone. I definitely want to include the 4-man group challenges too. Difficult game mode: This mode will have experience rates lowered by a lot and will get separate highscores. I also plan on receiving unique rare items when reaching certain milestones at this game mode. I cannot say when all these changes find their way into the game, but I'll be working on them from now on. I've also delayed the new boss a little bit more, because I just haven't been able to get things done yet. Lots of smaller projects and idea compilation were taking up my time.